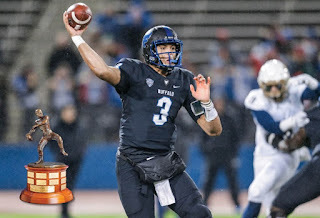 BUFFALO, N.Y. -- University at Buffalo quarterback Tyree Jackson has been named to the preseason watch list for the Davey O'Brien National Quarterback Award – an award given annually to college football's top quarterback. Jackson is the first quarterback in school history named to the list. He is one of only 26 players recognized. Entering his third season as UB's starting signal-caller, Jackson started eight games for the Bulls in 2017. He threw for 2,096 yards and 12 touchdowns to only three interceptions. He also added 197 yards rushing and four scores. The Academic All-MAC selection averaged 341 yards passing and threw nine touchdowns over the final four games of the 2017 season. The Davey O'Brien National Quarterback Award is presented annually to the nation's best college quarterback and is the oldest and most prestigious national quarterback award. Quarterbacks from all 130 NCAA Division I Football Bowl Subdivision (FBS) schools are eligible. Sixteen semifinalists for the award will be named on Tuesday, Nov. 6. From that list, the Foundation will announce the three finalists on Monday, Nov. 19. The 2018 Davey O'Brien Award winner will be unveiled live Thursday, Dec. 6, during The Home Depot College Football Awards. The 2018 season marks the 12th year that fans will be invited to participate in the voting process on VoteOBrien.org. Results from the Davey O'Brien fan vote will be combined with the ballots from the selection committee. Fan voting, which accounts for five percent of the total balloting, will begin on Tuesday, Sept. 4. The 42nd Annual Davey O'Brien Awards Dinner will be held Monday, Feb. 18, 2019, in Fort Worth, Texas.